Brighton & Hove failed to crash the Manchester City party as records tumbled for the champions at the Eithad Stadium tonight. Pep Guardiola's side ran out 3-1 winners thanks to goals from Danilo, Bernardo Silva and Fernandinho after Leonardo Ulloa - with his first Premier League goal since December 2016 - had briefly drawn Albion level in the first half. The hosts also bid farewell to Yaya Toure, who was playing his final home game for the club -also his first start of the season - ahead of leaving at the end of the season. The Ivorian boasted a glistening eight-year career with City, playing 315 games and winning seven trophies. While the night belonged to the home side, with the score at 2-1 Albion did ask a number of questions and on another night Anthony Knockaert would have tucked home a decent second-half chance to draw them level. 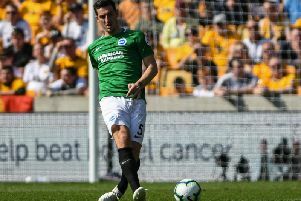 It was far from a doom and gloom display, rather at times, an encouraging one for Hughton's side as they look to next season. Albion went into the game with Premier League safety secured; coming in fine fashion as they ended a run of six matches without a victory with a 1-0 success over Manchester United on Friday night. The Seagulls did have the unenviable record, however, of having gone 11 Premier League away matches without a win since beating Swansea on November 4. Hughton's side had also lost all four of their away games against the top-six clubs without scoring a goal. They had also never won away to City in a league fixture. They made one change to the team that beat United with Ulloa coming in to replace Glenny Murray up front. City, however, rung the changes with just Gabriel Jesus, Fernandinho and Leroy Sane retaining their starting place from the side that drew 0-0 with Huddersfield Town. City dominated the early possession and territory and the first effort came from them in the ninth minute. Bernando Silva slid in Jesus on the right of the box and his cut-back was met by Gundogan, but Shane Duffy put in a timely block. The home side led on 16 minutes as Sane slotted the ball in behind Gaetan Bong and Danilo showed him a fresh pair of heels to race in one on one and calmly slot into the bottom corner. The lead lasted just four minutes, however, as some questionable goalkeeping helped Ulloa level for the Seagulls. A long ball forwards from Anthony Knockaert saw Claudio Bravo race out of his goal to try and intercept, but Davy Propper beat him to the ball, took it wide and crossed for the Argentine to nod into an empty net. Toure rolled back the years on the half-hour mark as he jinx to the byline and drove a low cross in for Jesus, who rasping first-time shot hit the side netting. The champions led again on 34 minutes as a ball across the box by Sane was missed by a couple of players and fell to Bernardo Silva at the back of the area. He was allowed time and space to set himself and picked out the bottom corner from 15 yards. City started the second half with the same possession dominance. They had the first effort as Ryan got enough on the ball to block a Fernandinho shot and after a bit of a scramble, the ball was cleared. Albion then had a fine chance to level as Bravo spilled Izquierdo's cross-shot, Gundogan's attempted clearance struck Propper and then Knockaert blazed over from six yards. Despite a good spell from the visitors, City killed the game off with a third on 72 minutes. A quickly-taken corner picked out Sane and he cut-back for Fernandinho to slam home past a static Albion. Jurgen Locadia and Beram Kayal were already preparing to come on before the third goal went in and they immediately replaced Ulloa and Pascal Gross. Toure got a fitting sending off when replaced with minutes to play and the last action saw Danilo's free kick crash against the crossbar and bounce to safety. Albion: Ryan, Bruno, Duffy, Dunk, Bong, Knockaert, Stephens, Propper, Izquierdo (March 79), Gross (Kayal 73), Ulloa (Locadia 73). Unused subs: Krul, Goldson, Schelotto, Murray. City: Bravo, Danilo, Kompany, Laporte, Zinchenko (Mendy 76), Fernandinho, Gündogan, Yaya Touré (Nmecha 86), Bernardo Silva, Gabriel Jesús (Diaz 83), Sané. Unused subs: Moraes, De Bruyne, Adarabioyo, Foden.